These female connectors allow for different cables to be used for the connection of lights or connections between lights. Pack of 5 female connectors for LTLN lights. Female connectors for enclosure lights, LTLN. Customers have the choice to install enclosure lights using their own cables, which can be cut to size. 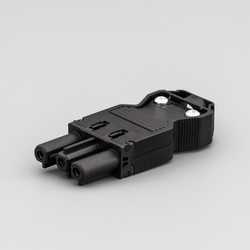 These connectors can be used to connect the enclosure light to a power source or to another enclosure light. The connectors provide a flexible solution giving the customer the choice of which cables are used for installation.